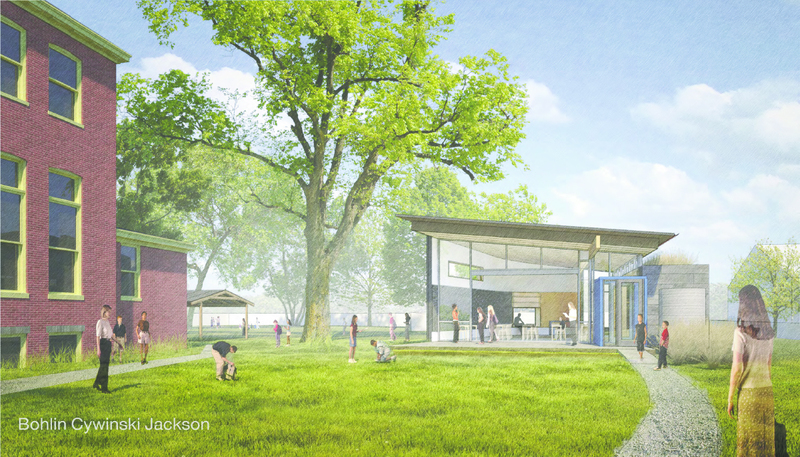 ABOVE: Rendering of the Waldorf School’s new classroom building, looking west towards S. Winebiddle St. Read more in the September 2018 Bulletin. Graphic courtesy of Bohlin Cywinski Jackson. Friendship – The master plan for the Waldorf School of Pittsburgh’s campus is driven by the maxim that “continued success requires expansion.” Comprised of four phases, the plan involves enhancing the main Victorian-era building at 201 S. Winebiddle St. to accommodate students in grades 1-8. The plan also calls for improvements to the adjacent yellow building that houses the school’s childcare program, which serves children between the ages of 18 months and 4 years. Finally, the addition of a completely new structure at the rear of the school’s 2.4 acre property would be the final project under Phase 1 of the master plan. Since 2012, Waldorf has completed six classroom renovations, as well as three grounds-related projects. The new single-classroom building, which is designed to house a class of 25 eighth graders, will help the school provide each grade with its own learning space (based on projected enrollments). Founded in 1993, the Waldorf School of Pittsburgh began in a small rental property on the South Side – with an enrollment of approximately 90 students in pre-K through fifth grades – before moving to the Bloomfield/Friendship area later that year. Waldorf now supports just over 240 students each school year; its first eighth grade class graduated in 2014. As the school expands, administrators are focused on aligning its physical growth with ideals of sustainability and place-based learning. Initially, their hope was to build a SEED (Sustainable Education Every Day) classroom for the eighth graders. Yet, after considerable deliberation, school officials decided that this type of modular classroom would not increase the value of the property and did not allow for enough aesthetic choices in the building’s design. The architectural firm Bohlin Cywinski Jackson (BCJ) was hired to design a new 1,000 square-foot space that not only adhered to sustainable building practices, but also harmonized with the main building’s architectural character. In concert with the natural green spaces on campus, the materials’ palette of the new building is muted and natural; an arced wall embraces outdoor green space that doubles as an amphitheatre for large school events. According to Kirsten Christopherson-Clark, the Head of School at Waldorf, the project will break ground next year – early enough to get the classroom ready for 2019-2020 school year. City Council approved the school’s Conditional Use application at a July hearing. In anticipation of the hearing, school officials hosted a public community meeting in May. Christopherson-Clark said she that most of the issues raised by the neighbors in attendance were inquiries about the structural details, energy systems, and how the community would be invited to share in additional uses of the building. BCJ is pursuing both a Living Building Challenge Petal certification and a WELL Building Standard with the new classroom’s construction. Living buildings give more than they take, creating a positive impact when interfacing with the human and natural systems around them. Waldorf would be the first school in Pittsburgh to achieve this recognition. City Council will take up legislation this month to allow a second dwelling unit to be added to single-family homes in a large portion of Garfield. Homeowners and homebuilders will have a two-year trial period to see if it is feasible to convert a basement, garage or third-floor attic into a second apartment, or tuck a “granny flat” into a newly-built house, as ways to make owning a home more affordable. The homeowner would need to remain the primary occupant of the house for as long as the unit is rented. The area of Garfield under consideration extends from Allegheny Cemetery on the west to N. Aiken Ave. on the east. Penn Ave. would not be included in the district. A public hearing on the bill is scheduled for July 25, at 2 p.m., in City Council chambers. The Garfield neighborhood could see the construction of its first modular home this summer on a lot at the corner of N. Graham and Hillcrest Sts. Module, Inc. received approval from the city zoning board in May to erect the house, which will be built in sections in a factory and shipped to the site. A homebuyer for the unit has already been identified. Brian Gaudio, a principal in the firm known as Module, has said he would like to build additional, for-sale homes in other parts of the neighborhood. Open Hand Ministries, currently renovating a single-family home at 208 N. Fairmount for a working-class homebuyer, appears poised to take on renovations projects at several other locations in Garfield. Pairing up with East Liberty Development, Inc. (ELDI), Open Hand has its sights set on re-doing houses at 4752 Kincaid St., 310 N. Fairmount St., 5521 Broad St., and 233 N. Aiken Ave. ELDI has managed to receive a commitment award of federal tax credits that will reduce Open Hand’s construction costs by as much as 20%, which will help keep their homes affordable to families earning under $40,000 per year. Councilman Rev. Ricky Burgess told two representatives from Garfield community groups last month that he will try to get the city to commit as much as $50,000 to seed efforts to plan for the future of Ft. Pitt School and an adjoining ballfield. The school has sat empty since 2011. A letter sent in March to school Superintendent Anthony Hamlet by Brothers and Sisters Emerging, Valley View Presbyterian Church, and the Bloomfield-Garfield Corporation requested collaboration from the school district in creating a facility that could be used by both the district and the community. The letter has gone unanswered. Brothers and Sisters, which organizes the Garfield Gators football program every fall, is concerned about the deteriorated condition of the field’s grass surface, and would like to see artificial turf installed in its place. Mayor Bill Peduto’s chief of staff, Dan Gilman, told the Pittsburgh Post-Gazette in June that a landslide which occurred in February behind a group of homes in the 5400 block of Broad St. was not triggered by what many residents feel was a poorly-executed house demolition the city oversaw last July. Four homeowners saw their houses condemned initially by the city after a portion of the hillside fell away from their homes. The occupants of two of those homes were able to return to them about a month later, but the other two owners have been forced to accept housing elsewhere. The point of origin for the landslide appears to have been the lot where the demolition work was done. The question remains as to who will take responsibility for reconstruction of retaining walls at both the top and the bottom of the hillside. The retaining wall that ran along the top of the hillside was knocked down by the demolition contractor the city hired last year to raze a house and rear garage that had been condemned at 5472 Broad St.
After almost two years of planning and engagement of neighborhood residents, the Board of the Garfield Land Trust is readying articles of incorporation for filing this summer with the Commonwealth of Pennsylvania. The land trust’s mission will be to find ways to create an inventory of housing in Garfield that is permanently affordable for lower-income individuals and families. A business plan is also being prepared that will have a variety of strategies the trust’s Board can use to achieve this goal. In a somewhat related move, City Council has approved Mayor Peduto’s nominees to the first advisory board for the Housing Opportunity Fund. The fund will have a stream of up to $10 million annually in city tax dollars that groups such as the Land Trust will be able to use to achieve their mission. Thank you to everyone who attended last night’s “Garfield Green Zone” meeting. 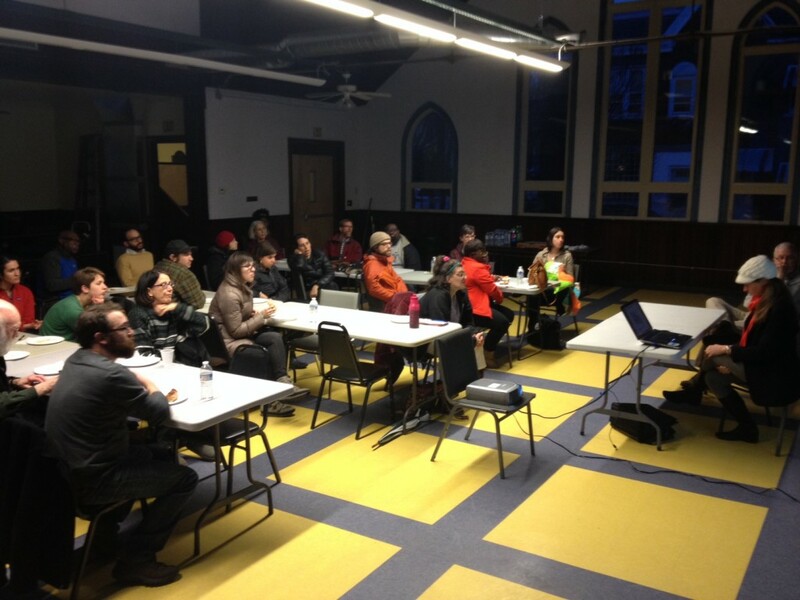 We greatly appreciate your input on the potential for green spaces in Garfield. As it is up to the community to decide how to proceed, we invite you and your neighbors to please give us more feedback on local ‘green’ initiatives. Let us know what you think of the proposals and feel free to contact the BGC with any questions or concerns. Thanks for showing up and voicing your opinions!